You can use the photo or the prompt word, or both to produce a haiku of your own. We always love to see your own images so be creative! Add a link in the comments at the end of the post (press the little black speech bubble to access). Last week the prompt was “Tide” and generated a flow of wonderful poetry! Kat Myrman has been the first this week to add her masterly poems, setting the high tide mark. ISM floods us with love this week! Ruth takes us on a journey this week. Beautiful. Ritu has taken the flow and produced wonderful patterns. Welcome to Ramblings of a Writer 2016 who gives us a cautionary tale. Judy Martin has the sands relaxing on the beach with this clever entry! Shadeau has gleaned treasures from the shores to create 3 wonderful haiku. Beach Clean Art has produced the most beautiful art on a new blog using found objects from the ocean. You should check out this! Art and life has produced a wonderful haiku cleverly placed on a stunning image! Add a Haiku Hub Logo! Ritu has generously put up a post explaining how to add the Haiku Hub logo to your blog if you would like to show you are a member. What a great bunch of haiku… And hubbers too!!! Thanks and so glad you enjoyed them. I will add all hubbers to haiku related posts from now on so we can get to stay in touch. It’s a great idea TJ! Thanks! It is lovely to see a few new faces too! The more we promote, the bigger it’ll get!! 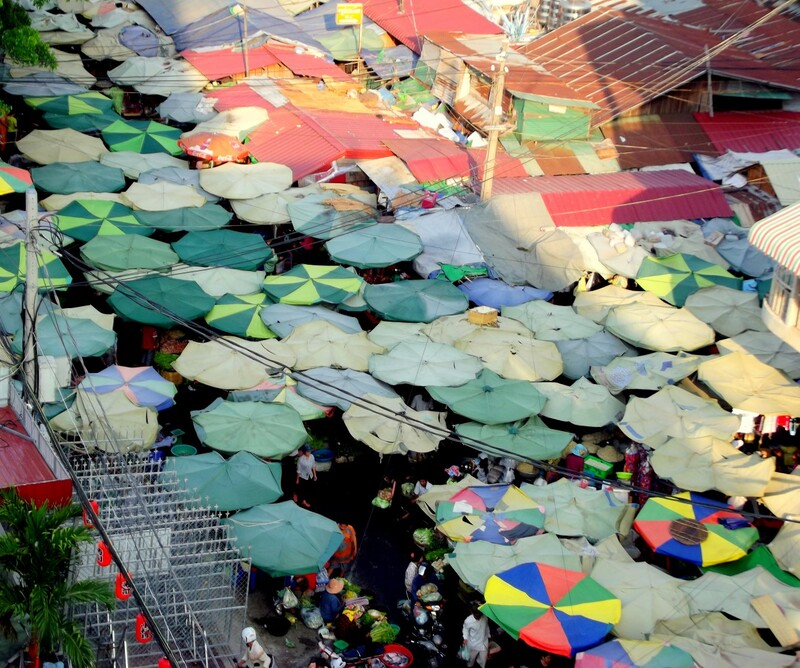 It was an uneasy feeling to look down from the balcony of a comfortable hotel to the very basic market below. The uneasy contrast of east and west. So glad you found time to write for this prompt. Here’s my entry this week, TJ! Loved the prompt! Thanks so much Freya. I love what you have done with it! Best wishes for a great week. Thanks so much Judy. It was a pleasing shot taken from the balcony of a hotel. Lovey. Thanks so much for participating despite the tricky prompt. Hope your headache is better! It’s gone… But for how long, I don’t know! The kids are driving me up the wall!!! Mind are mostly grown up but they can still give you headaches! They have that never ending ability to stress you out…! Can’t believe I managed this prompt! Fantastic! I admire your capacity for writing. I struggle with one. Here is my very first Haiku what do you think?